Adzuki beans are not something I associate with Indian food so when a friend first told me about this adzuki bean dal I thought it was some kind of macrobiotic hippy/ Indian fusion dish. In fact adzuki beans are used in all over India where they are known as red chori beans. I’m glad I’ve finally discovered the adzuki bean India connection because these red beans make a sensational dal with a rich, thick gravy. Adzuki beans are also one of the more easily digested pulses. There’s quite a long ingredient list and complex layering and tempering of the spices and aromatics in this dal but don’t be put off because I think the final result has a depth of favor that makes it worthwhile. It’s good to have all your spices and aromatics laid out near the stove so you don’t get into strife and burn the flavor base. This recipe comes via Madhur Jaffrey and is her version of a dal from the famous Gujarati Rasoi stall in the Borough markets, London which specializes in Gujarati home-style cooking. I’ve made a lot of different dals over the years and this is one of the best. 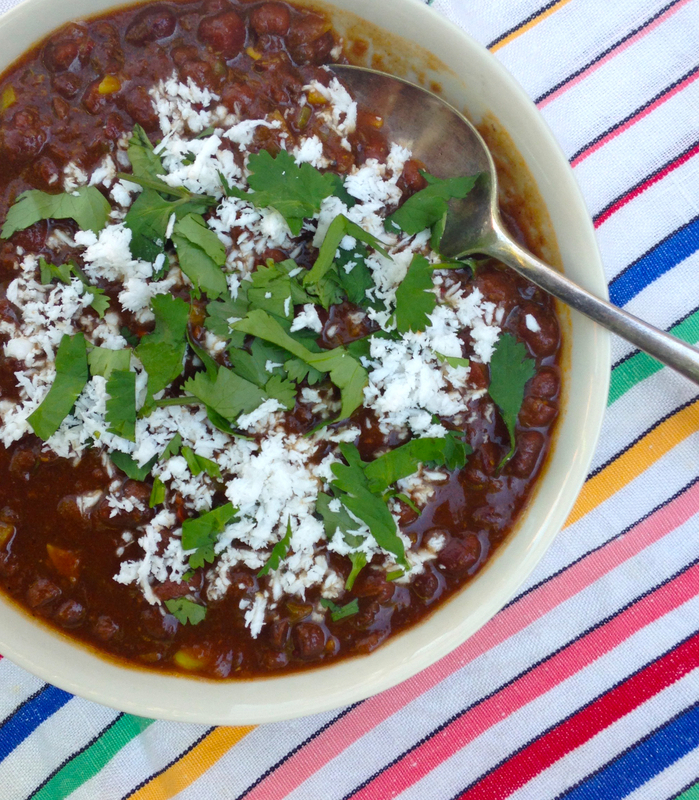 Adzuki beans have a natural sweetness and creaminess that make this dal feel deliciously rich and lush almost like a healthier version of Dal Makhani. Place adzuki beans and soaking water in a 20cm saucepan. Bring beans to boil over a high heat/ Lower heat, add sugar. Cover and simmer with lid lightly ajar for about one and half hours until beans are tender and slightly broken up. Measure out spices and other ingredients and place near stove. Place ginger, chillies, coriander, cumin, tumeric, garam masala, salt in one small bowl and the onion and finely chopped garlic in another small bowl. When beans are cooked empty beans into a bowl and wash and dry saucepan. Heat oil in saucepan. When oil is hot throw in cinnamon quill and let sizzle for a few seconds, then add dried chilli and let sizzle for about 20 seconds until it is darkened. Add tomato passata and cook for a further three minutes when spices are nicely melded add beans and simmer uncovered for about 15-30 minutes or until dal thickens. Before serving add lemon juice, coriander and fresh coconut and stir through.